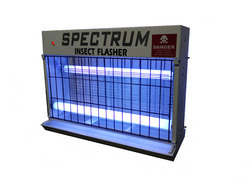 We are one of the prominent manufacturers of a wide range of Insect Flashers. These have flying insect flashing system and are widely used by multinationals, large Indian corporations, public sector units and railways. 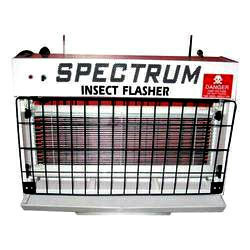 The flasher is meant for killing flying insects and flies and is known for its noiseless operation without any emission of fumes, chemicals and odor. Our flashers are safe, durable and eco friendly. These are offered at economical prices to the clients. The flying bisect flashing system is widely used in hotels, clubs, restaurants, snack bars, canteens, dairies, bottling plants, pharmaceutical companies, bakeries, food processing and canning industries, fisheries, abattoirs, office receptions, lounges, conference rooms, computer rooms and confectioners. Application areas: Clubs, restaurants, snack bars, canteens, dairies, bottling plants, pharmaceutical companies, bakeries, food processing, canning industries, fisheries and abattoirs, office receptions etc.HEAVY DUTY MACHINE.. FLYING INSECT FLASHER MACHINE. These are suitable for 2 Nos. 18/20 W black-light tubular lamps. The flasher is mounted on the wall and ceilings and available in 617 mm X 465 mm X 252 mm (approx) dimensions. Further, these consume 65VA approx energy. These are suitable for 2 Nos. 18/20 W black-light tubular lamps and consume 75VA approx of power. It is available in the dimensions 617 mm X 630 mm X 252 mm (approx). The flasher can be mounted on the walls/ceilings. FLY KILLER MACHINE.. COMPLETELY MAINTANANCE FREE. Looking for Insect Flasher ?